For the topping - Melt the maple syrup and coconut caramel in a saucepan on a low heat. Blend the almonds until they are finely chopped but not too much or they'll turn into a flour consistency. Place the almonds, oats and the melted sauce into a mixing bowl and mix well. For the fruit - Cut the pears into small chunks making sure you remove the core/any seeds. Place the pears, the raspberries and the blackberries into a (non-stick preferable) saucepan with about 2cm of hot water and simmer on a low heat until the fruit has softened. Finally, place the fruit into a ceramic oven-proof dish and top with the almond and oat mixture. Sprinkle with some more oats and pop it into the oven for about 15 minutes or until the topping has turned golden brown. 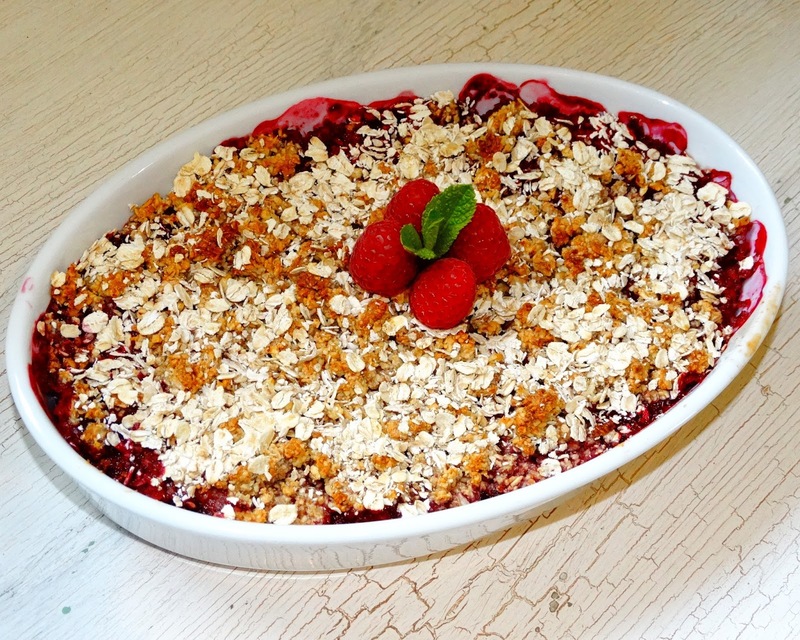 Hope you love this crumble as much as me and my friends did! It's the perfect pudding for the Easter weekend to share with family & friends. Enjoy!